What is COP11 / MOP1? COP11 - the 11th Conference of the Parties that signed onto the 1992 United Nations Framework Convention on Climate Change (UNFCCC). The UNFCCC was signed by over 165 countries; more than 100 ratified the agreement through their own parliaments. COP has met each year since 1995. 'MOP' refers to the Meeting of the Parties (to the Kyoto Protocol). The Kyoto Protocol only came into effect in February 2005 and was signed by more than 150 countries, so Montreal 2005 was the first 'Meeting of the Parties' that has taken place since its coming into force - hence MOP1. 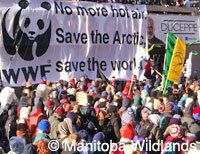 Both COP11 and MOP1 were held November 29 - December 9, 2005 in Montreal, Quebec, Canada. UNFCC refers to the United Nations Framework Convention on Climate Change. The Sierra Club of Canada's Planetary Citizen's Guide to the Global Climate Negotiations (PDF) or How to Use a MOP provides an easy to understand review of the issues behind the 2005 Global Climate Negotiations. 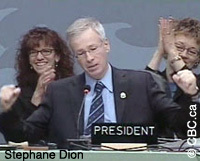 Canada offered to host the COP11/ MOP1, and Canada's Environment Minister Stephane Dion, was president of the conference, and sits as chair for the next year. Firstly, none of the previous 10 COPs have taken place in North America and the location provided unprecedented access for North American journalists to the meetings. Secondly, as Chairman and President of the COP, Hon. Stephane Dion has been criss-crossing the globe for months to find common ground among different countries in order to make the most of the occasion of having everyone in the same place at the same time. The significance of this is that the MOP meetings are also the first round of discussions concerning follow-up to the Kyoto Protocol, otherwise known as the 'second commitment period' (post 2012). The first Kyoto Protocol commitment period is 2008-2012. ENGOs (environmental non-government organizations) and NGOs (non-government organizations) had to have UNFCCC observer status in order to attend COP11/MOP1. Some ENGO representatives were also part of their country's official delegation. In addition to attending plenary sessions and making submissions where permitted, ENGO and NGO representatives hosted, facilitated, and attended side and parallel events associated with COP11/MOP1. Equally important were informal opportunities to strategize, provide positions and information, and lobby country delegates at COP11/MOP1. Media briefings, events, and providing information to those not in attendance (including the general public) were also part of ENGO and NGO activities at COP11/MOP1. Notably, over 500 individuals representing member organizations within Climate Action Network International (CANet) were in attendance in Montreal. Working together, through daily CANet press briefings, specific side events, CANet international strategy sessions, and regional CANet strategy sessions - for Canada, US, Japan, US, African, Asian CANet member organizations - CANet was able to arrive at consistent objectives and messages for the entire negotiations period in Montreal. Sierra Club Canada, as host of CANet Canada, was also able to bring 120 Sierra Club accredited participants to Montreal. Sierra Youth Coalition (SYC) actively reminded delegates, the media, and the rest of CANet how important the future is through their daily 'street theatre' events, and 21st century lyrics for 1960's and 1970's protest songs. Equiterre was host CANet organization in Montreal, and largely responsible for the successful 40,000 strong Montreal march Saturday December 2, international climate action day.